Nothing brings people together like the tasting language of good food. Chef Deborah Burchell "Chef D" and her husband Mr Bryan Burchell "Mr B"'s Caribbean Tasting Menu event was spectacular. We started off this feast with a delicious Cod Fish Fritters with a Tamarind sauce. Every single bite was perfect. The best part is when that tamarind sauce soaked into the fritter. So, so good. Then we had the Trinidad Brown Stew Chicken with Coconut Rice. That creole brown sauce was to die for. 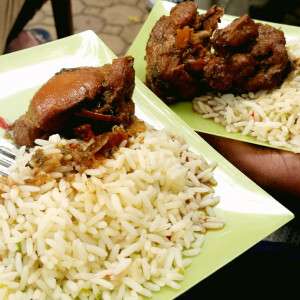 The stew chicken leg and tight cutup so moist and just perfect with the delicious rice. Can't have a Caribbean tasting without rice and peas right? 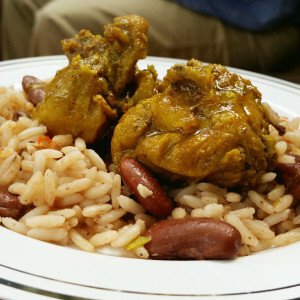 Well let me tell you, this Curry Chicken served with Rice and Peas was by far one of my favorite dishes. Could be because I am myself a caribbean girl and this to me is a staple. I personally love red peas. I could taste the spices in every single bite and the aroma of the curry brought me to another place. Just excellent! The next dish was the Herbed Tilapia with Tropical Salsa. The papaya and mango citrus salsa had a little spice and it was the perfect mate for the grilled tilapia. The fish was not flaky at all and every bite awakened my taste buds!!!! I was a happy girl. Next up was the Jerk Chicken Breast with Warm Cabbage Salad. ...you get it. Clearly, it was all SO GOOD! and WELL WORTH IT. 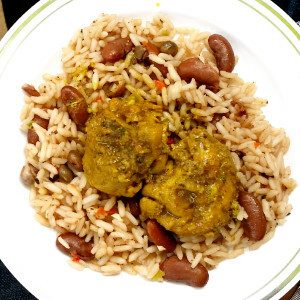 Hope I made you hungry and inspired you to want to cook some caribbean food!!! Well, easy. You can purchase the Cookbook written by the Burchell's entitled : Mastering The Art Of Caribbean Cooking.